The yearning to visit distant locations by way of motorcycle doesn’t need be answered atop a two-wheel Winnebago. Any old motorcycle, with a little help from the aftermarket, will suffice. Although, an active imagination and a stalwart disposition doesn’t hurt. Oftentimes, the desire to go far and wide is bestowed upon those of youthful age with more time than money. If you’re a part of this category, or simply prefer to share the experience with the non-touring bike that you own, here’s a few useful tips for making the trip more enjoyable. 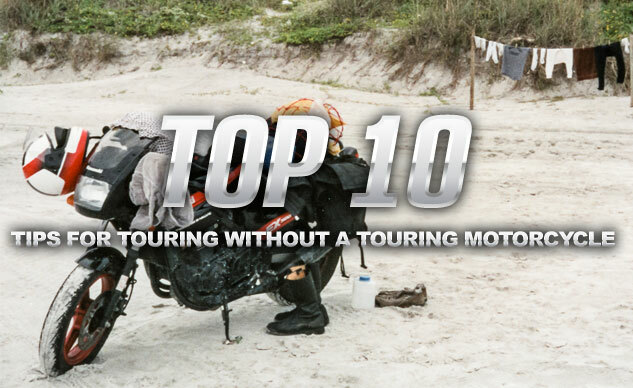 On a related note, we recommend checking out Evans Brasfield’s Top 10 Motorcycle Hacks. Previous « Inside Info About Kawasaki’s Radical H2 Sportbike?